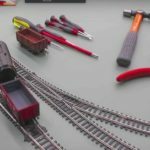 Want to learn how to weather your trains? 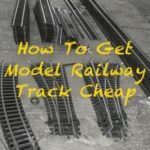 Here are six great model railway rolling stock weathering tips from the darkest corners of the web to get you started and add faux-rust, dirt, grime, grease and weather marks to your trains. 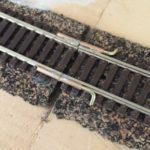 Weathering is an art as much as a skill and takes years of practice to perfect but you can remove the factory-perfect finish of new trains and add realism and get started relatively easily. 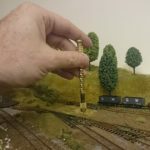 It doesn’t matter if your rolling stock is Hornby, Pico or Bachmann these six tips will help you get started with some basic techniques. More tips from urbaneagle . To fade the letters, put a drop of solution [decal setting solution – MRE] over top of what you’d like to fade. Begin gently rubbing the letter with the eraser [pencil eraser – MRE]. Not every model will react the same way. Some will begin to fade very quickly and with little pressure. With others, you may need to let the solution set for a few minutes and apply a little more force. To be safe, start lightly and continue working until you start to see results. In most cases, once you begin seeing results, the process will continue rather quickly. Continue rubbing until you’ve faded just what you want. If remnants from the lettering make it hard to see your progress, wipe off the solution and apply more clean liquid. Be careful not to rub too hard or you’ll begin to remove the paint underneath the lettering as well. Using a brush can be hard work. Wouldn’t life be easier if you could have the benefits of water colour paints but apply with the accuracy of a pencil. 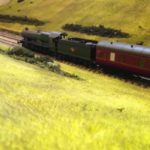 This next tip is a video from Model Railroad Hobbyist rather than a web page and showing how water-soluble coloured pencils can be used to apply weathering. 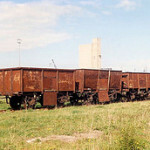 New freight cars are a little too shiny as they come right out of the box. 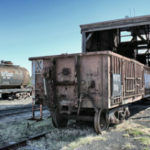 Just killing this plastic shine can make your rolling stock look a little more realistic. Use a spray from a can of Testors brand “Dullcote” (or a similar product that dulls a finish) to lightly cover the car. This can also form a base with a little more “tooth” for some of the techniques mentioned later. 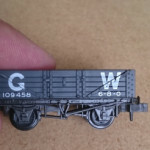 If you want to fade or modify some of the lettering on the car, do that first before using Dullcote, as the over spray will fix the lettering as it is. Always work in a well-ventilated area, preferably outside, when using a spray can. 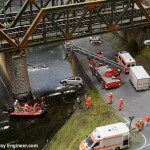 Source article available at National Model Railroad Association.